Beautifully detailed piece .. Solid bronze metal .. Lovely weight and feel .. All in great vintage condition .. Please see description and photos below. Gift boxed, making this a great gift for any hare or wildlife lover! Hare height 14.5cm (5 3/4") approx, width 8cm (3") approx. Beautifully sculpted piece made from Cold Cast Bronze. High quality and can be displayed indoors or in the garden. 71cl Gin Balloon with HARE Frieze design. Small Crystal Glass Bowl engraved with HARE Frieze design. Bronzed Flying Fighting Hare 28cm High Bronze Reflections Leonardo Boxing. 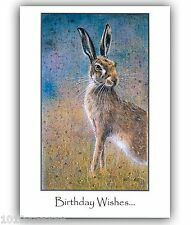 A great gift for any hare or wildlife lover! Hare height 21.5cm (8 1/2") approx, width 9.5cm (3 3/4") approx. How to Iron on the Hare Patch. Remove the iron and allow the patch to to cool. Lift the towel and check to see whether the patch is fixed on securely by gently rubbing at the edge with a finger, trying to lift it. "Lying hare" weighs in at a comfortably solid 14.5 grams, and fits in the palm of your hand with room to spare. 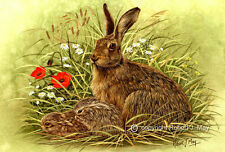 Gift boxed, making this a great gift for any hare /wildlife lover! 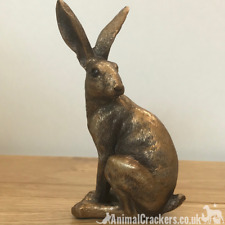 This bronze effect hare is from the Reflections collection. Bronzed Sitting Hare by LEONARDO. Gift boxed, making this a great gift for any hare or wildlife lover! Hare length 17 cm (6 3/4") approx, height 11 cm (4 1/4") approx. 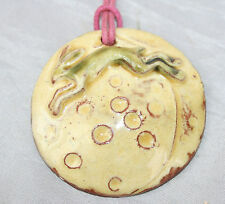 Pottery cornish Moon gazing hare Handmade in Cornwall Beautiful gift Approx 6" High ANY QUESTIONS PLEASE ASK! PLEASE NOTE WE RECYCLE PACKAGING WHERE WE CAN , THIS IS TO KEEP THE P&P COST LOW FOR YOU AND TO HELP THE ENVIRONMENT! ANY PROBLEMS WITH YOUR ITEMS PLEASE CONTACT US BEFORE LEAVING FEEDBACK , WE WILL ALWAYS ENDEAVOUR TO SORT PROBLEMS OUT Please check out our other items! Gift boxed, making this a great gift for any hare or wildlife lover! This is a brand new collectible from Frith Sculpture in bronze. This was an unwanted present, still in its original packaging. Will be dispatched Royal Mail 2nd class signed for, please get in touch with any questions. Small Sitting Hare Sculpture. 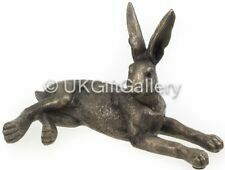 Bronze Hare Sculpture from the Reflections range. A hare will squeal when hurt or scared and a female will make "guttural" calls to attract her young. Dimensions 4cm X 6cm. SOLID SILVER HARE EARRINGS < . 925. 2cms. A stunning bronze piece, with incredible detail, adding distinction as either a centrepiece, or main attraction to any dwelling. Superb, Bronze, Pair of Running Hares, securely mounted on solid, black Marble Base. Leaping Driftwood Hare. Condition is New. Dispatched with Royal Mail 2nd Class.I am a Driftwood Artist searching the beaches of Kent for interesting driftwood. Each piece I make is unique. Length 49cm x Height 24cm. 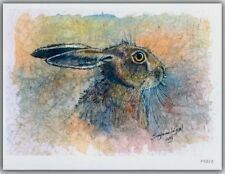 Gift boxed, making this a great gift for any hare or wildlife lover! Hare height 13.5cm (5 1/4") approx, length 14 cm (5 1/2") approx. By Lisa Parker. 'Solstice'. Wall Plaque. Size : Approx 25 cm x 19 cm. They make wonderful gifts for nature lovers and are a fantastic introduction into the world of bronze sculpture collecting, at a very reasonable price. "Sitting hare" weighs in at a comfortably solid 13 grams, and fits in the palm of your hand with room to spare. This is a cold cast bronze sculpture of a Hare. Note: This piece is made using the cold cast bronze process, it is real bronze, but the item will be more fragile than a foundry cast piece. A stunning bronze piece, with incredible detail, adding distinction as either a centrepiece, or main attraction to any dwelling. Superb, Bronze, Pair of Boxing Hares, securely mounted on solid, black veined Marble Base. 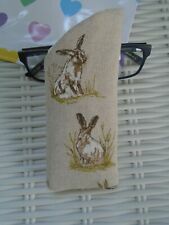 CUTE HARE OR RABBIT COIN PURSE. PICTURE ON ONE SIDE PLAIN CALICO BACK - LINED - WITH ZIP. It is made of a polyresin and finished with aluminium to give a silver colour. It will be supplied in a gift box so could make a great present! 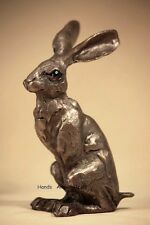 Leaping Hare Pewter Pin Brooch - British Hand Crafted - Mad March, Rabbit Bunny. Leaping Hare Pin Brooch Hand Crafted by a British Artisan in English Pewter. Fitting to reverse of spike with compression collar. Gorgeous 3D Holographic Picture from the renowned designer, Lisa Parker. 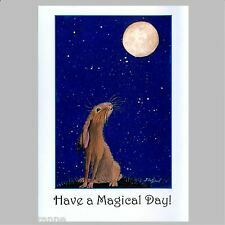 Encapturing the beauty and elegance of the Hare, adding the Holographic effect makes this picture extra special. Looks incredibly realistic, as if you could reach and touch the fur of the Hare. Wooden Boxing Hraes by Sculptor Robert Campbell. Size approx 18cm x 9cm x 29cm high. 35cl Crystal Wine glass with HARE Frieze design. Height 205mm approx, Capacity 35cl approx. This table or bedside lamp lights up any room. The Lamp takes a small crew in bulb (SES) MAX 40w available from all super markets etc. (Bulb NOT included). A Large over sized Pair of Bronze Boxing Hares. 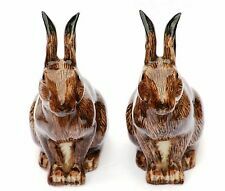 This fantastic pair of bronze hares would look great outside on the Lawn, outdoor table or even a focal point inside. The larger hare reaches 3ft tall (92 cm x 45 X 30) second hare (75cm x 50 cm x 22). 30cl Dimple Base Whisky Tumbler / water glass with HARE frieze design. Height 100mm, Capacity 30cl approx. 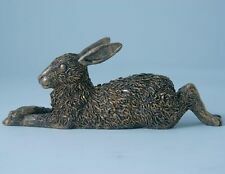 Sitting Hare made of bronze resin . Now painted light grey white lovely just look at the pictures Condition is New. Dispatched with Royal Mail 1st Class. Cold cast bronze hare in a laying down pose.